Solution to the first problem would be to filter the 4.4.4/24 network at R3 from being advertised back to RIP. When there are multiple points of redistribution, and the network which is being redistributed could only be reached via one path, then the initial router which is exchanging routes to another routing domain (redistributing) must not choose any other path other than the one from which it initially learned. For this problem we could do either filtering at R3 or at R2. The below example demonstrates to filters the route at R3 by setting the metric to 16. Debug ip routing shows that the 4.4.4.0/24 network via R3 gets deleted from RIB. Solution to the second problem does not relate to redistribution rather a normal distance vector protocol behavior. Even if R2 receives the 12/8 network via RIP from R3, it does not use that RIP update as it has the network directly attached. 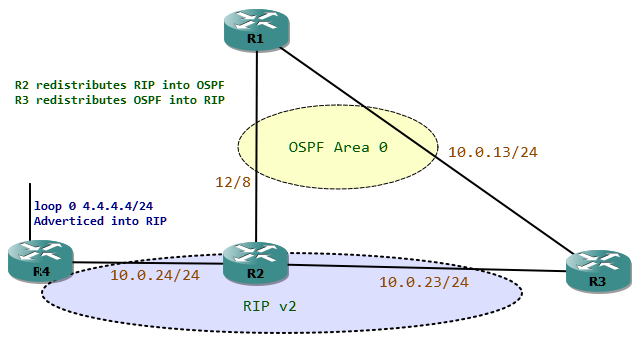 To resolve this issue redistribute either OSPF or connected at R2 into RIP. In this particular case R2 could also generate a default route. To conclude, if a route 'X' could only be originally learned from one particular source, the same route 'X' must not be relearned from any other source. DV protocols only advertise a network, if the network is added under the corresponding routing process using the network command or if it has a route in the RIB learned via the same routing protocol.